This connection method enables MySQL Workbench to connect to MySQL Server using a socket file (on Unix) or a named pipe (on Windows). In addition to a number of parameters that are in common with Standard TCP/IP connections, this connection method includes a unique field to configure the socket path or pipe name. 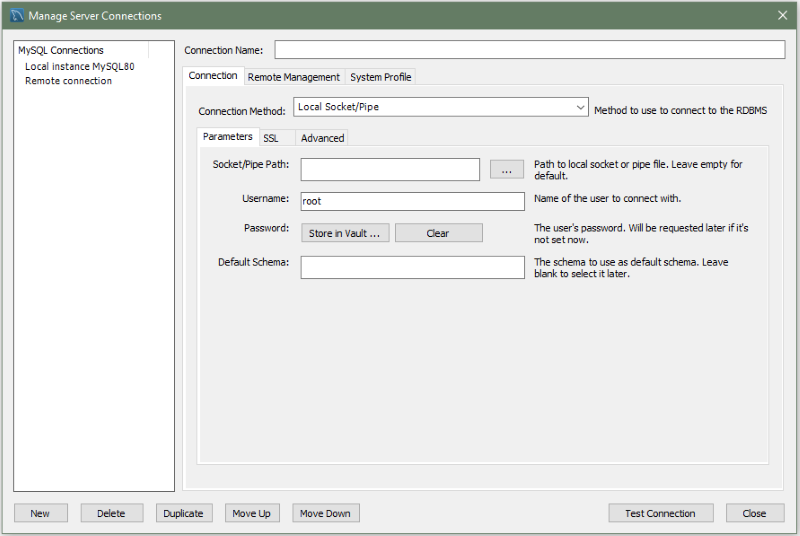 As the following figure shows, you can supply the path to the socket file or pipe name within this dialog. If the field is left blank, the default socket or pipe name is used. On Unix, the default socket name is /tmp/mysql.sock. On Microsoft Windows, the default pipe name is MySQL. The SSL options for this connection method are the same as the options described in Section 5.3.1, “Standard TCP/IP Connection Method”. The advanced options for this connection method are the same as the options described in Section 5.3.1, “Standard TCP/IP Connection Method”, except the Use compression protocol and Timeout options do not apply.